We assessed CT-derived left ventricular strain in a cohort of patients referred for transcatheter aortic valve implantation (TAVI) and validated it against 2 dimensional speckle tracking echocardiography as the gold standard. 65 consecutive patients with symptomatic aortic valve stenosis referred for CT imaging prior to TAVI were included in this analysis. For all patients, retrospectively ECG-gated multi-phase functional CT data sets acquired with identical reconstruction parameters were available. All data sets were acquired using a third generation dual source system. In all patients, multiphase reconstructions in increments of 10% of the cardiac cycle were rendered (slice thickness 0.75, increment 0.5 mm, medium smooth reconstruction kernel) and transferred to a dedicated workstation (Ziostation2, Ziosoft Inc., Tokyo, Japan). Additional functional reconstructions for dynamic assessment and quantification of strain were processed. Multiplanar reconstructions (MPR) of the left ventricle similar to standard echocardiographic 4, 2 and apical 3 chamber views were rendered in CT. Similar to echocardiographic longitudinal strain, the perimeter of the left ventricle was manually traced within the myocardium and peak maximal shortening as a parameter representing longitudinal strain was calculated for each view and averaged to obtain a marker for global longitudinal strain (CT perimeter-derived strain). Furthermore, for quantification of 3-dimensional strain, endocardial and epicardial borders of myocardium were marked in six short axis views and peak maximum 3- dimensional strain of the myocardium was calculated in standard six basal, six mid and four apical segments. 3-dimensional strain values of the 16 standard segments as well as perimeter-derived strain values in the three standard windows were averaged to obtain global strain. Echocardiography was performed in all patients before CT data acquisition. Digital loops were acquired from three apical views (four-, two-, and three chamber views). For assessment of 2 dimensional global longitudinal strain (GLS), recordings were processed with acoustic-tracking software allowing offline semiautomated speckle-based strain analyses. The mean age of all 65 patients was 81 ± 5 years. The mean echocardiographic ejection fraction and mean echocardiographic GLS were 50 ± 12% and −13.6 ± 4.5%, respectively. The mean CT-derived peak 3-dimensional global strain and mean peak strain derived by perimeter was 43.2 ± 13.5% and −11.2 ± 3.5%, respectively. Both CTderived global 3D-strain and perimeter derived strain showed a significant correlation to GLS derived by echocardiography (r = −0.8, p < 0.0001 for 3D strain and r = 0.71, p < 0.0001 for perimeter-derived strain). Bland-Altman analysis showed a systematic underestimation (i. e. worse strain values) of CT perimeter-derived strain compared to GLS by echocardiography (mean difference −2.4% with 95% limits of agreement between 4% to −9%). ROC Curve analysis assuming a normal GLS when less than −18% showed that a CT-derived peak 3-dimensional global strain cut-off-value of 45% has a sensitivity of 91% and a specificity of 60% for detecting normal left ventricular strain (AUC 0.81, p = 0.001). 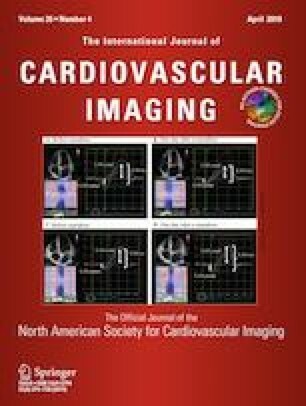 For CT perimeter-derived strain, a cut-off value of −12%—assuming a normal echocardiographic GLS when less than −18%—achieved a sensitivity of 82% and a specificity of 61% (AUC of 0.82, p = 0.001) for detecting abnormal left ventricular strain. Using dedicated software, assessment of CT-derived left ventricular strain is feasible and comparable to strain derived by echocardiographic 2 dimensional speckle tracking. We would like to express our sincere thanks to Mr. Tsuyoshi Nagata from Ziosoft for his help and assistance in the pre-processing and analysis of the strain data as well as his continuous support with data analysis. Mohamed Marwan has received speaker honoraria from Siemens Healthineers and Edwards Lifesciences. Martin Arnold is a consultant for St. Jude Medical and Edwards Lifesciences. The other authors declare that they have no conflict of interest.